Doesn't it feel like a really long time since i won the Beautiful Creatures competition from Barry M and here i am all this time later and only just speaking about the single pressed eye shadows. 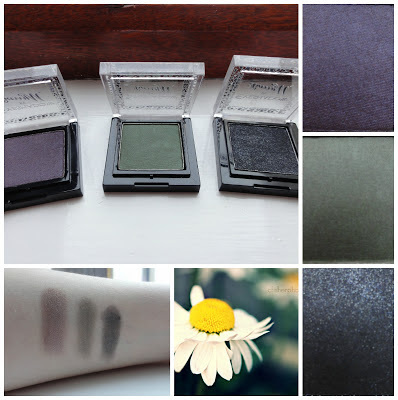 The selection of single pressed eye shadows are varied with a shade to suit everyone's taste, there isn't a lot to choose from but everything is quite minimal everyday wear with neutrals and a few pops of colour. I actually really like everything that's available and i'm pretty sure majority of the shades will suit everyone. I believe these shades choosen were down to the movie it's self Beautiful Creatures - it's dark and quite gothic. The shades however are absolutely beautiful, three in total two matte and one with the most gorgeous shimmer. All three have fabulous pigmentation and are buildable depending on how dark you want them. I made a gorgeous smokey eyed look yesterday using the purple and shimmery black shade and a white eye shadow base from another brand and it looked stunning. The shades i got are E2 (black with shimmer) E4 (purple) and E6 (green). All are quite creamy and really soft, easy to apply and last really well. I definitely recommend them and for £4.49 each they are worth the price. It's only recently i cracked this open and used it, i'm such a lover of bronzer's and this is probably the best one have used by far. The bronzer is a matte formula and is buildable if you want a lot of coverage to the cheek area. I believe with this a little goes a long way and it doesn't need a lot but the colour is beautiful and really adds a pop of colour to the cheeks giving you a beautiful healthy glow. This is £5.99/£6.99 depending where you shop and on offer for £4.99 at superdrug where there's a 3for2 along all make up products (mix and match) at the moment. All products are available to buy at Barry M, Boots and Superdrug online and Boots and Superdrug in store. I'm currently holding a raffle to raise money for Pendleside hospice to win a selection of cosmetics worth £50.00 for more information please click the Pendleside hospice tab on the right. I have also entered my blog into the cosmopolitan next newcomer awards 2013 and your vote would mean everything to me if you love my blog then please vote for me using the cosmopolitan tab on the right. If you like what you see and want to stay in touch click the GFC, Google+, Bloglovin' and Twitter tabs that can be found here, there and everywhere on my blog (mainly on the right, Google+ at the bottom) I'm on she said beauty too. I don't own many Barry M products at the mo (Just an eyeliner and a couple of nail paints) but hoping to try some more from them soon. Found your fab blog via the Northern Beauty Blogs Blog Hop and now following. The shades of the eyeshadows suit you perfectly, its like it was designed for your skin tone. I think you should do an eye make up look finally, please!!! I finally watched the film, it was something different, I'm glad he remembered her at the end, xoxo. Yes finally a make up look hun!!! lol. The books are normally better I agree but I haven't read beautiful creatures, xoxo. Wow you have a lot of planned reading. I find reading books helps cut back spending for me, so that way I spend less time looking at products online lol. There's a new campaign coming out on bzz agent today to do with hair, I hope we get an invite, xoxo. hi..lovely blog...would you like to follow each other on both gfc and bloglovin...?